Today was another exciting day. I attended my very first industry reading. What is an industry reading one might ask? An industry reading is when a show is presented before producers and other potential investors in hopes of having a commercial run. The actors perform the full show with scripts in hand and depending on space, minimal costume and set, if any at all. The reading today was for a show called “The Beaten Path” by the talented & dynamic singer/songwriter/composer Bobby Cronin (a fellow “Adaumbelle’s Quest” participant). Formally titled “B.R.A.T.T. Camp,” “The Beaten Path” tells the story about a group of kids who get sent to boot camp in hopes of having their mischievious/self-destructive ways reformed. Each character maybe going through their own emotional journey, but together they are all going through the journey of life and growing up. 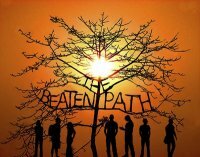 “The Beaten Path” is an emotional and at times humorous musical that deserves to be taken. The music Bobby has written really drives the story forward and easily allows the audience to feel the strong emotions of these characters. The young cast he chose for the reading was fantastic, comprising of Andrew Barbato, Zachary Infante, Megan Pietrantonio, Julie Reiber, Emily Rogers, Justin Stein, and Derrick Trumbly. In a world where one can easily feel disconnected, Bobby Cronin knows how to make you feel connected. If you are looking for a show to produce this will hopefully be the one you choose, contemporary & modern, with a lot of heart! Bobby Cronin is a writer/director/composer to keep your eyes on. He writes in a contemporary musical theatre style with powerful, yet touching lyrics. Bobby’s work has been seen in the U.S. & abroad. His musicals include: “B.R.A.T.T. CAMP”, a contemporary pop/rock musical which had a capacity-max reading produced by New York Theatre Barn at MTC studios in 2007; “‘TIL DEATH DO US PART”, a large musical about the mystifying murder of a southern preacher; “THAT’S ANDY”, a new musical about a boy who wants to play “Annie” in his local town production; “A CHRISTMAS CAROL”, a musical adaptation of the classic story which has been seen at regional theaters across the country as well as on tour; and with the support and guidance of Stephen Schwartz himself, Bobby directed, developed, and wrote a musical entitled “FROM THIS DAY FORWARD A SCHWARTZ MUSICAL JOURNEY”, about four twenty-somethings living and loving in NYC, using over 100 songs of Mr. Schwartz’ to tell this story. Bobby just completed a two-performance, one night only sold-out live recording concert of his music entitled “Reach The Sky” at the Laurie Beechman Theatre in NYC featuring some of today’s biggest and brightest Broadway stars. If you missed this incredible concert, you do have a chance to catch an encore this Sunday, August 23 at 7pm at The Duplex in NYC. Be sure to catch this show! For more on Bobby, visit http://www.bobbycronin.com. 1. Who inspired you to become a composer? Ever since I was a little boy, I would make up songs; in the backyard, on the ice while playing hockey, in my bedroom while trying to fall asleep. I never took piano lessons but was obsessed with the piano. Composing was my greatest hobby. I would write to express my feelings of sorrow or elation or confusion. I found it easier to put those feelings into song. 2. Who is the one person you haven’t worked with that you would like to? Stephanie Block — for real. 3. Do you have any strange or unusual talent that no one knows about? I am a great hockey player. 4. Favorite way to stay in shape? Rollerblading, weight lifting, walking instead of taking the subway. 5. Boxer or Briefs? Boxer briefs!! 6. Animal Crackers or Oreos? I would say the inside of the Oreo. 7. Favorite drink? Diet coke, Iced Coffee, or Tequila! 8. Favorite author? I prefer biographies or autobiographies. 11. Summer Resort or Winter Retreat? Summer Resort. 12. How old were you when you had your first “real” kiss? 5th grade…on the bus coming back from the haunted house.